Okay, I'm back! I'm exhausted and a little sunburned and happy as can be that we had another magical trip to Disney. Most Excited Yet Patient Airplane Waiter goes to Munchkin! Boy, this kid just couldn't WAIT to get to Disney. He waited and watched our plane forever before boarding. He was so patient! Worst Day of Vacation Award goes to Wednesday! This is the day that was low 60's and rainy and one child developed croup and another was barfing in the elevator in a grocery bag. Good times... (Lucky for you, I have no photos demonstrating this). Most Confusing Moment of Scolding goes to American Idol Experience! If only I'd been quicker on the draw with the camera! A security guard resembling Emmanuel Lewis came from no where and scolded Big Guy then opened the chain with a shake of his head. I'm not sure my hubs ever quite figured out what happened or who was talking to him from down there! Most Transformative Souvenir Shop Item - Rocker Wig! Most Common Activity Men Engage in While Standing in Line - BlackBerry! Best Boy Pool Thrower - Big Guy! 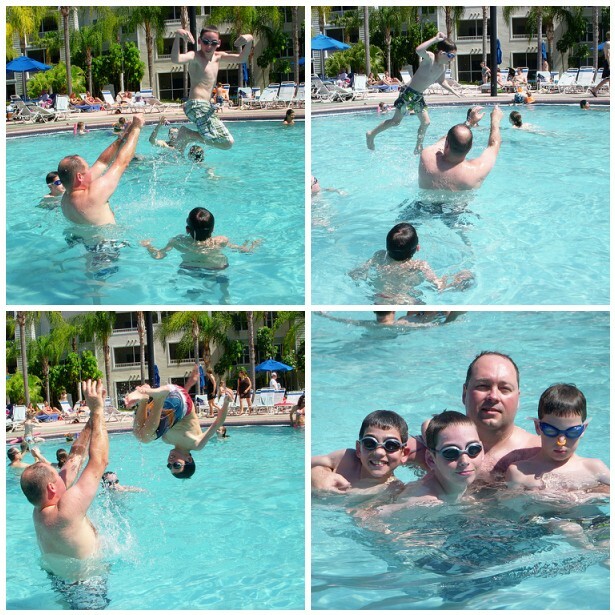 That guy can throw a boy in a pool like nobody's business! Woot! Now, don't forget that Tuesday marks the beginning of our weekly Tutorial Tuesday Linky Parties! I will host the first giveaway and you can win by linking up your own Tutorial. I want you to teach me stuff! Check back here tonight to get a jump on the linky or catch me here in the morning! yea!! another magical trip!! that's awesome..i ♥ Disney too! glad you're back, safe, sound and ready to keep on a bloggin'! oh, and you are totally spot on right about the blackberry being the grown man's Nintendo DS...i could not agree more! Welcome back! Glad that you had a yuck-o day on a rain day....really would have been bad if the weather was perfect! Fun recap of your trip. Your family portrait is the best! I just laughed at your family portrait. Awesome! Sounds like a fantastic trip - glad you enjoyed yourselves!! I love your family picture!! The best! Great awards! I smiled the whole way through this post... until I got to the end. The final picture and I completely LAUGHED OUT LOUD! Hilarious! So glad you're back! Your BLACKBERRY comment is SPOT ON! Yep, just like the kids with the DS's! What hotel/resort did you stay at? Beautiful pool shots! Love the family shot also. Glad you had fun, except for the rainy day. ugh. What a great vacation! I really enjoyed the pictures too. Your husband appears to be addicted to his blackberry - common problem among men our age. I applaud him for his dedication to staying connected! Looks like a great vacation!!!! I always love your vacation awards post!! And how TRUE is that about the men on their blackberrys!!!! I was texting Chip while we were at dinner a few weeks ago to remind him I was there!!!!!!!! Hi JJ! Thanks for participating in the Kindred Connection this week! I loved your vacation awards post! What a super cute idea... Hope you've had a wonderful Thursday!